In the end, I learned a valuable lesson about advertising. A world where all pre-teens wear shorts with long-sleeved, long-tailed shirts on top. A Far-Off Place style adventure where three white children are stranded in a hostile environment with only a skateboard, a suitcase and winning smiles. Something that actually might have made me smile, now that I think about it. An adventure in which only Jenny Lewis thought to bring a change of clothes. Video game characters magically coming to life, perhaps as a result of a desert heat-induced hallucination. An inexplicably off-model Mario that’s approximately the size of a fighter jet. A fictional pop cultural landscape where the anonymous green cobra enjoys the same level of fame as with Mario. 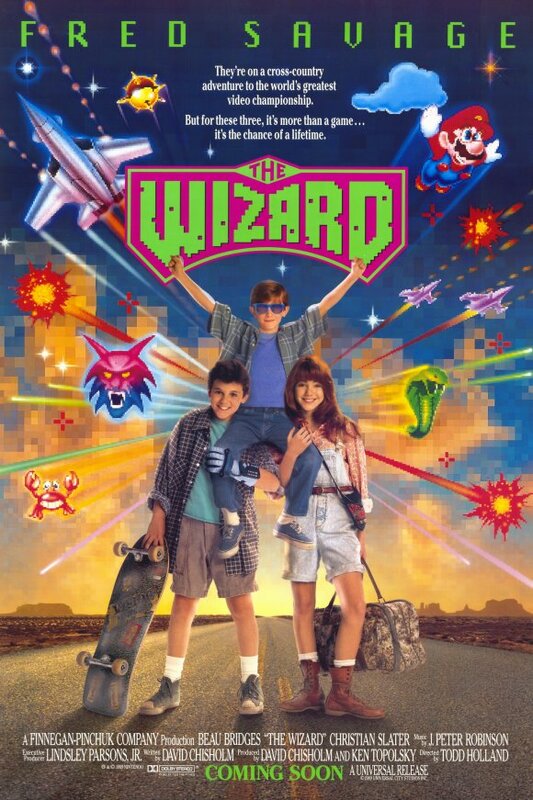 Fred Savage using the Power Glove to face-punch bad guys he meets in the desert. No appearance by Christian Slater whatsoever, because who would cast him in a movie of this era and then not put him on the poster? A movie that takes place somewhere more interesting than Reno. A young Jenny Lewis incurring an exit wound. Maybe a story about a blind paraplegic, based on that pose. More top billing roles for Fred Savage. I don't get #6; the Mario is the same model as the one used on the SMB3 box art, just a lot more pixelated... and minus the Raccoon power-up, since they probably wanted to preserve the surprise(?). Is it, though? I'm looking at it again and it seems weirdly distorted. Aren't the eyes bugging out too much? When I saw this movie at the video rental store as a kid, I thought it would be a movie in which real-life kids go into the video game world, a la Captain N. I was disappointed as a kid when I watched it, but have grown to love it. Full disclosure: I actually have only seen it once and never looked back. I have little to no recollection about the plot, other than it took place in Reno for at least a brief part.